Up until a few months ago, I really disliked my hair. While I’d always coveted straight, sleek hair, I was stuck with puffy, frizzy hair. Since my early teens I mostly wore it pulled back in a high or half ponytail, which worked pretty well, but it wasn’t exactly the glamorous look that I sometimes wanted. Occasionally I would use my hair straightener to get sleek, straight hair, but it always took a lot of time and I just don’t like spending a lot of time on my hair. So for the most part I just lived with my puffy, frizzy hair. Fast forward to a few months ago, when I read a series of hair posts from Melissa at Dyno-mom. While trying to make peace with her own big, puffy, frizzy hair, Melissa discovered the curly girl method, a means of caring for curly hair based on the book Curly Girl: The Handbook. The basic premise of the book is that curly hair is entirely different from straight hair and thus needs to be cared for in different ways. When you care for your curly hair appropriately, you can have healthy, beautiful, and even frizz-free curls. After reading Melissa’s posts, I started to wonder whether I could be a curly girl. I’d always known that my hair was a bit wavy, but I’d never thought of myself as having curly hair, I suppose because my hair never seemed to form many individual curls. I decided to check out the Curly Girl book from the library and start experimenting. After a few days, it was clear: I do have curly hair! It’s not super curly, but it is definitely distinctly wavy. Unlike people with more defined curls, though, my curls are delicate enough that any brushing while my hair isn’t sopping wet causes them to completely lose their shape, leaving me with the puffy, frizzy hair that I’ve never liked. I can’t tell you what a revelation this was. I never would’ve guessed that all that puffy hair was due to the fact that I was constantly brushing out my curls. Over the past few months I’ve worked on perfecting my curly girl method routine. I’m still experimenting a bit to see what works best, but the improvement over my old hair is completely amazing. For the first time in my life I actually like my hair! Appearance isn’t everything, of course, but it’s so nice to feel confident and happy about a previously nettlesome aspect of my physical appearance. It’s fast: Remember how I said I don’t like spending a lot of time on my hair? Well, the curly girl method is quick. After you shampoo and condition your hair in the shower, all you have to do is comb it out, scrunch it with a towel to remove some water, then scrunch in some hair gel. You then just leave your hair alone while it air dries. The whole process doesn’t take more than a few minutes of hands-on time. I really don’t think I’m spending more time on my hair then when I used to just put it in a ponytail. I love this. You can use natural hair care products: The curly girl method works very well with natural hair care products. Since the method mainly relies on accentuating your hair’s natural characteristics, you don’t need loads of toxin-filled products to force your curls to “behave.” Depending on your preferences, you can either make your hair care products yourself or choose to buy high-quality, toxin-free commercial versions. I have had success with both approaches. It can be quite inexpensive: You can certainly spend a lot of money on the curly girl method if you choose to buy the most expensive natural hair care products. I have had great success, however, using inexpensive products like Castile soap and making my own products like flax seed hair gel. I think that you can have beautiful curls no matter how much money you’re willing to put into your hair care products. Is the Curly Girl Method for You? If you at all suspect that you might have curly or wavy hair, I highly recommend checking out Curly Girl: The Handbook. If you’ve always had complaints about your hair, it may be just what you need to finally start having an enjoyable hair life. And let me tell you, it is a great feeling to actually like your hair—especially without having to invest a ton of time or money in it. Do you have curly hair? How to do take care of it? My daughter is a curly girl who puts her glorious hair up all the time. I've sent her this post! :) Hope she finds it helpful. I just put the book on hold! Your hair looks beautiful! A couple years ago my hairdresser told me to stop brushing,and instead spray with water & run my fingers through my hair to style it. It was good advice! @Janis - yes, do not brush!! Never brush. I also only shampoo my hair once per week because curly hair has a tendency to dry out and get frizzy from shampoo. On the other days I just scrub it thoroughly with my fingers. I use it everyday, or sometimes every other day if I didn't wash my hair that day. I think it's recommended to use it a lot less frequently (like maybe once a week?) but I have really oily hair so I wash it almost every day and then I figure I should probably condition it, too. It seems to be working okay for me. Hmm...I don't know about your curly vs. straight hair products question. I'd think that if your hair is at all wavy, I'd try treating it like it's curly/wavy and see what happens. My hair ended up being a lot wavier than I thought it was. I think there are also products specifically designed for wavy hair, so maybe try those instead of others aimed at more curly hair? Grrr! I keep trying to leave a comment by phone will not let me. I read this in my email and I love it! You look so great! I think it is so empowering to come to terms with what we really are, and you my friend, are a curly girl. An awesome one! Aww, thanks, Melissa. And a lot of it is thanks to you--if you hadn't written that series I don't know how long it would've taken me to come to the realization. After all, it's hard to find help for your curly hair when you don't even know that you have curly hair! I have curly hair,and used to be a hairdresser, so here i what I do... Wash with a low sulfate shampoo, only a few times a week, I wash 2x a week with shampoo. The other days if needed, I 'wash' my hair with conditioner, as long as you scrub your scalp it will be clean. The very first time you try the curly girl method, wash your hair with conditioner only and it will show you how naturally curly your hair is. You can also make a spray bottle of water and a few squirts of conditioner, with a few lavender leaves. This will refresh your curls on the days you don't wash! I have curly hair, and have fought with it all my long life (I'll soon be 64!) I discovered, just in the last year, that any kind of chemical treatment (color, perm, etc.) killed the curl in my hair. So I've gone all natural now, and the curl is back. I just wash and condition about twice a week, towel dry, add mousse or gel, finger comb it the way I want it, and let it air dry. I now get SO many compliments on my hair! I'm going to try some of these natural products, just see what kind of improvement I can get. But for the first time in my life, I actually like my hair! 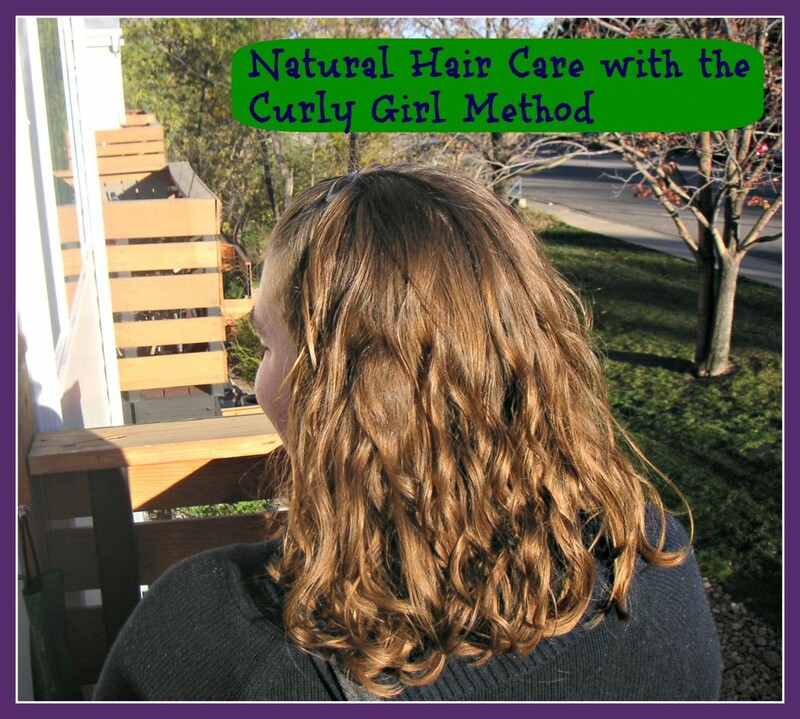 I used to use the Curly Girl method and I loved it! My hair is fine, but very big and curly. However, I have been trying to reduce the plastic waste in my life, so going through all those bottles of conditioner was no longer an option. Now I use a moisturizing shampoo/soap bar to clean my hair a few times a week, followed by a rinse of diluted red wine vinegar to get all the soap out and make my hair shiny. I also use coconut oil or shea butter to condition, especially in the winter. No plastic needed! One tip for curlies: chuck the brush. I just use my fingers to detangle, and I get no breakage and less frizz. Thanks for sharing your experience, Sophia. Eventually I'd like to head in that direction, too. Do you find that the red wine vinegar still helps your curls? I have heard from someone else that vinegar does not do great things for curly/wavy hair. Meghan, your hair is beautiful and shiny! I stopped using shampoo three years ago on my long thick curly wavy hair. Instead I use baking soda and water followed by vinegar and water, and then conditioner, once a week. Sometimes I soak in the bath with a tablespoon of olive or almond oil. My hair and skin really love this. Shampoo damaged my hair much, much more than my 3-day-a-week chlorine pool habit. I stopped brushing my hair, using a pick instead. Less frizz! This regimen has set me free. The best thing for my hair? Other than no shampoo, swimming in the ocean water and allowing it to air dry in the salt breeze, for a full-on mermaid look. When I was within the first few weeks of no-shampoo, I went to a hairstylist for a cut. I requested that she not use shampoo. She tried to talk me out of it. When I was leaving, I overheard her talking to another stylist about how grossed out she was since I wouldn't allow shampoo. I never went to her ever again. She probably does not miss me either. Now I go to a stylist who specializes in cutting curly hair and doesn't give me grief about no shampoo because she gets it. I once went to a stylist who would only cut my hair if it had been shampooed and blow dried straight. I never went back to him either, even though I had requested someone who could cut curly hair when I scheduled the appointment. The salon owner swore to me they had someone to do the job. Hairstylists can put the pressure on clients to buy the chemically laden products which quite frankly, damage my hair more than anything. I am very selective about who cuts my hair because it is too traumatic otherwise. My Nana used to say "What pretty curls you have" and I've hated my hair all my life. I've kept my hair cut short to manage it. I call it my Airline cut as a quick brush & a flick and it's done. A year ago, I injured my knee and was confined to rest for many months. I just never got around to getting my hair cut, which I normally did every 3 months. It's now a year and it's got quite long (for very short hair). I was told to spray it with water with a few squirts of conditioner in it. Wow! All of a sudden, my curls are under control and I've learned to love them over 50 years later! Good to see some other useful tips I can try too. Ok, a couple comments: I had oily hair too until I switched to the all natural "no poo" method. I tweaked it a bit. I add a couple squirts of castile soap to the shampoo to add suds, and I add a couple drops of almond oil to the conditioner/rinse. This eliminates the need for a gel afterwards! I love being all natural, and I did not want to put a commercial gel on my hair after taking time to wash it naturally. Using all natural products "resets" your internal oil-o-meter, as I like to put it. We are no longer stripping out the natural oils, so our body is no longer over compensating by producing tons of oil. I no longer have oily hair, and I wash on the 4th day instead of everyday like I did with commercial products. I comb my hair during the rinse portion of cleansing my hair (I have curly permed hair) and I don't comb it again. I let it air dry. I get wonderful, tight, no frizz curls! Thanks for sharing your experience, Tina! Unfortunately switching to natural products has not made ANY difference in my hair's oil production. I haven't used commercial shampoo in at least 2 years but my hair always stayed incredibly oily. Interestingly, the thing that has made a difference is pregnancy. I'm currently 37 weeks pregnant and at the moment I can comfortably go three days without my hair getting gross. (I've also always had super oily skin, but now my skin is awesome--not oily but not dry.) This has been true for the last few months. So for me, at least, I really think that the excess oil that I normally get is due to some sort of hormonal imbalance. Which makes total sense to me, because I have other symptoms of hormonal imbalance, too. Now I'm really curious to see what happens after pregnancy...crossing my fingers that things don't go back to exactly what they were before. Pregnancy will certainly throw your body and hormones for a loop! Please do post any changes. Do you breastfeed? (I hope) You may go through even more changes there, and not be back to "normal" until after. Thanks for your kind thoughts, Tina. :) I'm planning on breastfeeding (this is my first baby). I hadn't thought of that as a factor, but you're right--who knows what sort of role that will end up playing! I adore the curly girl method! I discovered it a few months ago and I now love my hair. I have insanely thick and curly hair and I secretly loved it,but it didn't show because I didn't know how to take care of it. Hey Meghan I love curly hair but I have straight long hair. I tried a lot for curly hair by naturally but I can't. Using of hair accessories is not good for every time. I like your post but I want to know some simple and easy method for curly hair. And If I didn't comb my hair for long time so is it possible that my hair will get curly. Please help me. Just like you, I have long curly hair that tends to dry-out and frizz. I used the Shielo Restoration OIl (applied to wet hair) helps retain the natural curl while adding deep shine and hydration. I have used Shielo's Oil daily for 6 weeks...and my hair looks so healthy!